Stems: Erect, stout, 1 to several, usually unbranched, minutely pubescent. Leaves: Opposite, simple, mostly sessile, smooth, lanceolate to linear-lanceolate, .5 to 2.25 inches long, .25 to .75 inch wide, shiny above, pale below, 1 main vein; margins entire, rough. Inflorescences: Clusters of 3-10 flowers, terminal or sometimes in upper leaf axils. Flowers: 5-parted; calyces 5-lobed, linear to lanceolate; corollas bell or funnel-shaped, to 1.5 inch long and broad, upright, deep blue to purplish blue, bearing pale greenish lines inside; lobes 5, erect or spreading with smaller toothed or fringed petal-like segments between each lobe; stamens 5. Fruits: Capsules, oblong, smooth, often enclosed in persistent calyx and corolla; seeds small, numerous. Habitat: Dry upland prairies and woods and rocky open slopes. Comments: Downy gentian flowers open 1-2 at a time during the daylight hours and will sometimes remain closed during heavily overcast weather. The flowers can withstand early autumn frosts and are often among the last observed in bloom on the prairie in the fall. "Gentian" honors an ancient Greek king named "Gentius" who is said to have treated bubonic plague victims with European yellow gentian (Gentiana lutea L.). 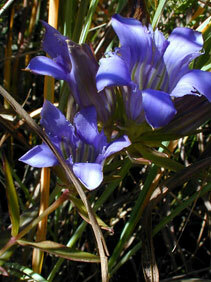 Downy gentian is difficult to propagate from seed. A single plant may produce thousands of seeds but many are infertile.